PHOENIX ATTORNEY MARK BRIGGS ON WHY AN ADVISORY BOARD COULD BE HELPFUL TO YOUNG COMPANIES. Over the years, I have worked with dozens of entrepreneurs who’ve had a great vision, but lacked key skills or experience they needed for their companies to reach their full potential. Entrepreneurs often have a lone wolf mentality, which certainly serves them well in many regards but it can also limit them, too. 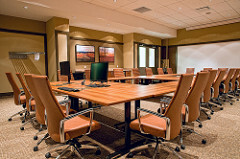 So one suggestion I often make to my entrepreneurial clients is that they create an “advisory board” for their company. An advisory board is basically a group of advisors of your choosing, who come together periodically (I suggest quarterly) to give you advice about how to run your company. They also can provide invaluable access to customers, key employees, capital and other resources. Unlike a traditional board of directors, an advisory board does not have legal duties to the company and its shareholders, and I find this creates more of a fun, creative atmosphere. That last point, especially, is reason alone to have an advisory board. As I’ve mentioned in previous blog posts, having someone to keep you accountable in your business is tremendously advantageous. An advisory board can serve this very role, bringing an outside perspective to your business and helping to keep your focused on the long-term needs and goals of your company. I will do some more blog posts in the future about the nuances of advisory board creation, direction and maximization. In the meantime, do you have any experience with an advisory board? Please share your insights in the comment section.